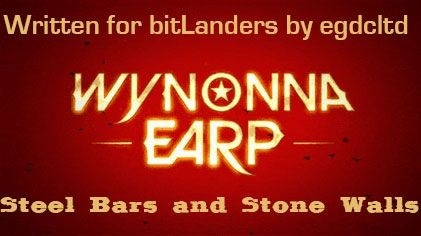 "Steel Bars and Stone Walls" is episode one of season two of Wynonna Earp, the fantasy western series based on the graphic novel series of the same name about Wyatt Earp's descendant. 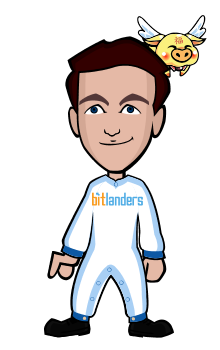 In this episode, plans are made to attempt to rescue Dolls from Black Badge. 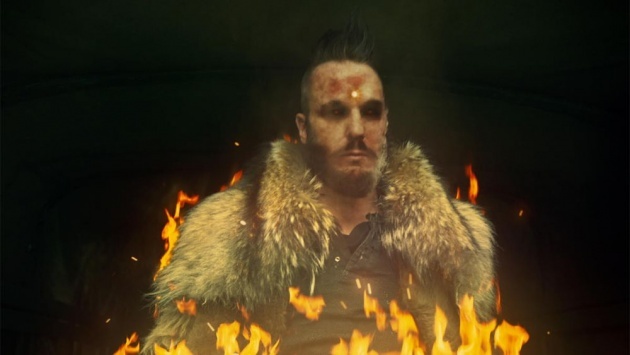 In the season one finale, "I Walk the Line", the strange man Doc encountered in "Landslide", Juan Carlo, had said that the Ghost River Triangle wasn't simply to keep the revenants in - it was to keep something out. The Triangle is a sanctuary as well as a prison. Willa had left the Triangle with Peacemaker and odd things started to happen. She said that Bobo wasn't the only one to speak to her in the treehouse. Then a giant, tentacled, Cthulhoid monstrosity attacked her. 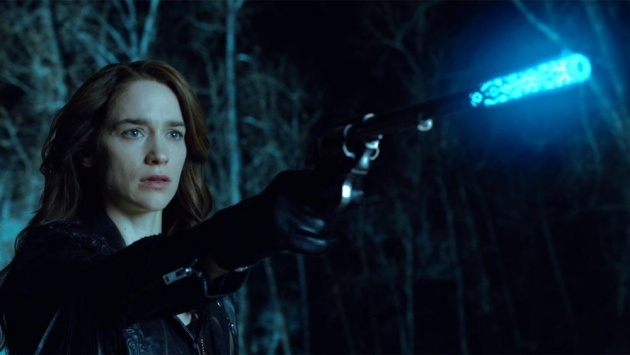 Wynonna managed to recover Peacemaker and shot Willa - something the latter wanted - and Peacemaker acted differently when that happened to how it does when shooting a revenant. Wynonna managed to get back into Triangle and, with Peacemaker back inside, the border was restored and the tentacle following her crumbled away. Agent Lucado then appeared with troops and arrested Dolls for disobeying orders. Given that the orders were to let a gate opened if it could be, this does raise questions as to just what Black Badge is up to and why they want a monster free. Lucado left with Dolls and Bobo, ordering a strike on the town once they were clear. As the truck they were on crossed the edge of the Triangle, Wynonna also shot Bobo - something he probably welcomed at that point. When Wynonna returned to Waverly and Doc, Waverly touched the residue from the tentacle and it clearly affected her. 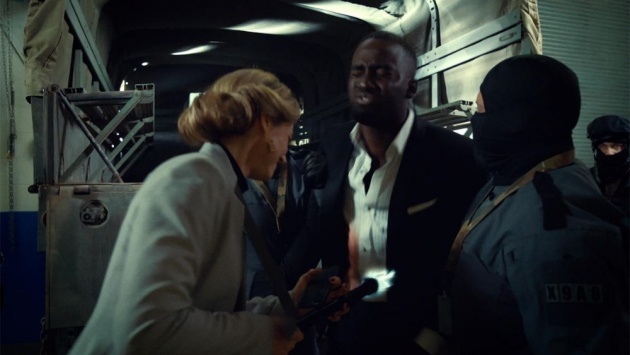 The episode ended with Waverly turning around and firing the gun she had. But who was she shooting at? Wynonna or Doc? Or something different? This episode opens with Waverly and Doc running through the woods. Waverly didn't shoot at Doc, but at something fiendish behind him. Something that would appear to be immune to regular bullets, because it's now chasing after them and seems rather annoyed. Doc himself gets annoyed when his hat falls off and the demon eats it. As the demon is about to leap on Waverly and Doc, Wynonna knocks it down with a branch before finishing it off with Peacemaker. Wynonna says that they will use the demon to help rescue Dolls. Dolls is in some sort of black site belonging to Black Badge and is on the phone with a superior. He tells Lucado that her Tomahawk strike on Purgatory has been called off, but she informs him that he is going to be transferred to a Black Badge prison soon. At the sheriff's department in Purgatory, Sheriff Nedley is speaking to a couple of reporters when Wynonna arrives. Once they leave, the sheriff apologises as he says he knows what she's done for the town. 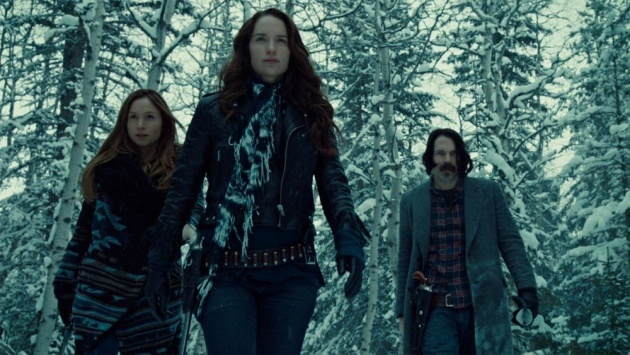 Wynonna may be the hero that Purgatory deserves but she isn't the one that it needs right now. Which leads to a discussion on Batman - Nedley has lost interest in the franchise - and then a question as to why he smells lemony. When Black Badge came in with the antidote to Bobo's poison, they stayed and are currently cleaning out all of Dolls' things. The sheriff has kept Dolls' mug but he also tells Wynonna that Dolls was too smart and too stubborn to keep anything important at the station. So Nedley asks Wynonna where Dolls sleeps. Which she says is a good question. Where turns out to be a motel. Wynonna picks the lock and enters then, when she hears something, tells whoever it is to come out real slow or she will call the cops. Also, she is the cops. Sort of. Technically. Not the best way to sound. The person does come out but not slow. It's actually a woman in her underwear who proves to be quite skilled at fighting. 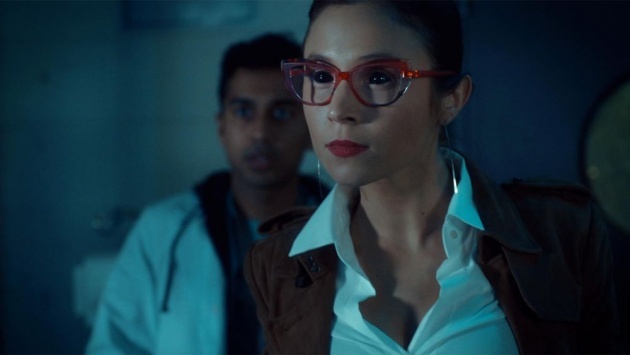 What Has the Tentacle Residue Done to Waverly? At the Earp homestead, Doc wants to know if Waverly is okay about the death of Willa. She says she is; even though she never really liked Willa, perhaps more okay than she should be. It's not clear what effect the stuff Waverly touched has had on her, but it's had some sort of effect. As is seen later. Once Wynonna and the woman stop fighting, they get properly introduced. Her name is Eliza and she's a friend of Dolls. Yes, that sort of friend. She's also Black Badge too. Dolls told Eliza that if she ever didn't hear from him for 24 hours she was supposed to burn his files. She didn't. Eliza says that Dolls will be transferred, but not immediately, to Black Rock Prison, where the average life expectancy is two months. So, they have only a limited amount of time to rescue Dolls before he ends up dead. Or worse. Dolls is currently in a cage and seems not in control of himself, undergoing whatever it is that's up with him. At the Earp place, Eliza is introduced to the rest as Dolls' friend. Waverly says - echoing Wynonna's own comment - in a tone of surprise that Dolls has a friend. Wynonna mouths to Waverly that Eliza's a 'friend' sort of friend. Eliza says that she can get them in to the prison, to a degree and, at one point, Nicole mentions that Dolls deputised her to Black Badge. 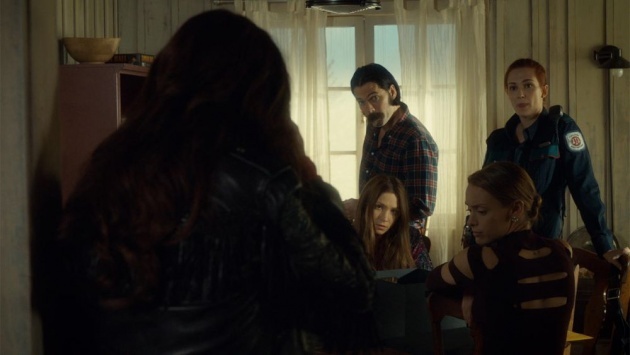 Wynonna wants Waverly and Nicole to check on the revenants in the trailer park now that Bobo is gone. Before that, Waverly takes Wynonna aside and asks when she last slept. Or ate. Or applied deodorant. Wynonna tells Waverly not to worry, for she has a plan. A real plan. One that, as it happens, does not involve Nicole and Waverly going to the trailer park. They need to get into Dolls' gun safe - it seems Black Badge didn't clear it out for some reason - and Doc has the combination. Inside the safe, Eliza discovers that Dolls' medicine is missing, but Doc kept some back. Eliza says it may be too late for Dolls already. The others don't know what's going on and Doc says that, for all of Dolls' good points, he isn't really a man. More is learned about Dolls and Lucado's hatred of him is purely personal; she blames him for the death of her husband. The black site does not allow guns, so they definitely need a plan. Multiple plans as it turns out. Black Badge also has some odd creatures on site, including one like that which attacked Dolls and Waverly. Only bigger. Black Badge really don't appear to be very nice people. According to Eliza they are incredibly secret and made Dolls what he is. So, are Black Badge Division well meaning extremists, or something darker? When Doc sees Eliza for the first time he comments that he does not believe they have met - the actors playing the parts have worked together in the past. Nicole comments, when Waverly is putting on an English accent, that that's the worst British accent she has ever heard. Dominique Provost-Chalkley, who plays Waverly, is in fact British - although it's unlikely that her genuine accent is as over the top posh as the one she uses in the episode.